UPDATE: I have cancelled my Aapproach account due to an unauthorized transaction, lack communication with anyone working as a vocalist instructor with the site, AND having no information about how to cancel anywhere on their website. In fact if you search in the FAQ you’ll get a person asking how to cancel on the AApproach forums but with no response. I absolutely do not recommend the Aapproach system. There are much better systems out there that offer good vocal training in addition to a solid business support foundation. My experience with Aaproach during 2012-2013 was that they were ONLY interested in money. After the sale, you are ON YOUR OWN! Buyer beware!! For a long time now I’ve been adding my own vocals to songs and singing in projects that I record. I have always been very interested in singing and have felt it has been a necessary ingredient to my musical work. Singing for me really helps build confidence and adds a lot of passion and feeling into the music that I play. Although I have never had formal voice training, I’ve always been interested in learning more about techniques and ways to improve the power, range, and versatility of my voice. Not to mention as I get older, to find ways to help keep my voice healthy. I feel the strongest aspect of my voice is the tone. As a big fan of Synthpop, I’d say my voice is similar to that found on the Thompson Twins albums. I can sing “Hold Me Now” perfectly, but would like to add some range and improve my falsetto. Who knows, perhaps additional vocal instruction will take me in a new direction of singing such as RnB and Jazz which I’m also very fond of. Today I signed up for a Total Access Premium Membership with the website Aapproach ran by the vocal instructor Eric Arceneaux. You can find some excellent vocal tutorials by Eric using the Aapproach method on his Youtube channel for those who wish to learn more about what sort of content is in the Premium area. I thought I would write some comments about the program as a new member for those interested in knowing more about it. I have found it difficult to find any concrete info about the Aapproach program from anyone in the program, so hopefully vocalists on the fence will find this info useful. Feel free to comment of send me an email if you wish to know more info about my Premium Membership experience and I’ll do my best to answer your questions quickly and as honest as I can. The package I signed up for was the Total Access Premium Lessons. This gave me access to ALL of the Premium lesson videos and the discussion forums for six months. Despite sales on some of the videos I’ve seen in the past, I feel I got a pretty good deal with respect to having access to all of the videos produced. I’ll also be able to have access to everything on the site for six months so I can see any and all updates as they progress. There is also a discussion forum where you can meet other vocalists and ask or answer questions about various subjects ranging from vocal reviews, techniques, health, and view other member performances. The videos are all top notch quality with respect to the vocal lessons and techniques. At this point I am 100% confident that Eric Arceneaux knows what he is talking about and that if I DO THE WORK, I’ll see improvement. It takes me a while to makes decisions to sing up for online websites, so when I do, I know I “most likely” have the right coach and material. Granted that view may change, I’m confident initially that I’ve made the right choice for the first six months in working with the Aapproach Vocal Method. Thus I highly recommend giving Eric Arceneaux and the Aaproach a try. My only big negative point about the Aapproach Vocal system is the lack of personal involvement by Eric and his staff with pre-existing members. When you check out the forums, there are posts, but almost all of them have no replies and there virtually is no clear presence of the Aapproach staff. You see the usual marketing “fluff”, but not any real attempt by staff to follow-up and help out or at least make things clear to existing members about policies or directions. For example, there is a whole list of people wishing to have their vocals reviewed in the aptly title “Voice Review” forum, but nobody responds to the members. I frequent forums A LOT, and the first red flag for a bad forum area is when there are no replies or guidance. Thus it’s clear the forums are not a strong point of the Aapproach system and I wouldn’t recommend signing up for that. The forums appear more neglected, but perhaps that may change in the near future. Let’s hope so. I also find the common problem with “What do I do know?” or “Where do I start now?” being asked quite a bit among members of the Aapproach vocal system. I even found myself asking the same thing, BUT, after watching some videos and taking a lot of time search around for stuff, I finally found some sort of direction to take. It could be made more clear, but there are paths outlined in the program if you just take the time to look for them….laugh. You just have to figure things out for yourself at times with the Aapproach. I actually find that the most successful Aapproach Vocal members are likely to be those who take things into their own hands and make things happen themselves. Eric Arceneaux and his staff appear to be very successful and BUSY! So to be honest, I really feel they don’t have time for members as much as they claim, but I understand that and likely will just stick to the videos. Private lessons are available anyway for those who want specific questions answered or require one to one help. I may try them shortly. In conclusion, my final thoughts about the Aapproach Vocal Lesson are positive. I believe the content is excellent and have found many other vocalists around the internet who have nothing but positive feedback about Aapproach and Eric Arceneaux. I am confident I’ll be getting some good advice and will be learning proper vocal exercises and techniques. If you are a person with lots of questions and are looking for a large vocalist discussion group, then I wouldn’t recommend the Aapproach. Brett Manning’s Singing Success I think has better support and discussion activity for singers so you might want more feedback and support. If you’re just into the nitty gritty and need confidence right away that what vocal instruction you’re getting is good, then Eric Arceneaux is fantastic. I’ll update this article with further thoughts and comments as I progress with my vocal instruction at the Aapproach website. I’ll also post videos of my singing here shortly for reference and so you can see how I progress. That might be interesting not only for me, but for those who are thinking about whether to start singing or add more techniques to their style. 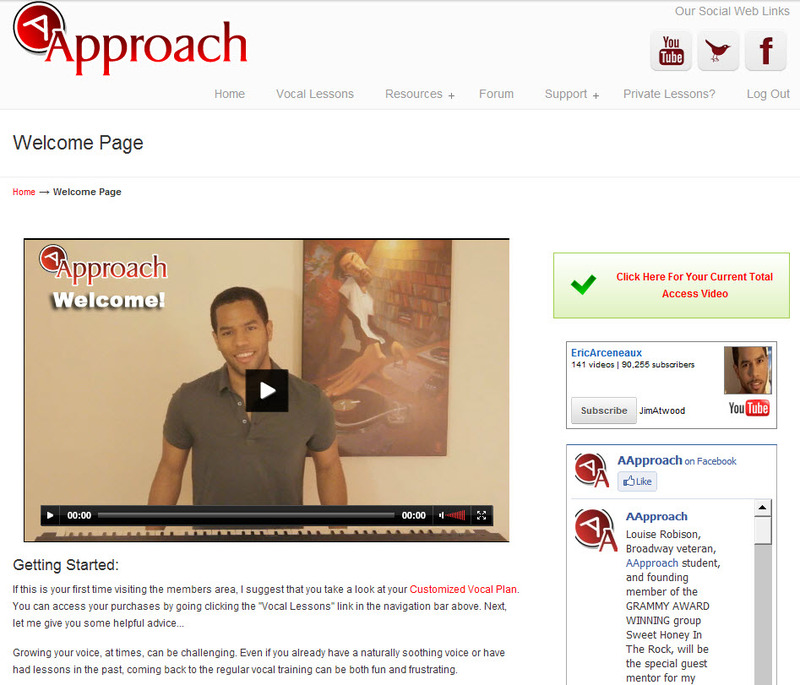 Here is an example video of Eric Arceneaux and the Aapproach vocal style lessons. UPDATE: Boy did I make a mistake with this vocal website. SAVE YOUR MONEY!!! I do not recommend this site anymore! This site is all about getting your money and that’s it! The forums are very inactive and the newsletter emails cut you off shortly thereafter. The Youtube videos are all you really need. Watch those and get help elsewhere after that. Aapproach.com was not worth it at all I’m sorry to say. I stand by my initial findings posted above that are mostly positive, but about a month later things crashed and burned from there. I have since found other vocal coach locally and I’m extremely happy with my results. Just stick to Youtube videos from inspiration and tips. From there get connected locally with a good vocal trainer. Online vocal lessons are not that great especially with people who can’t take care of their members like on Aapproach.com.